GATE exam dates 2019 - Check all the important dates of GATE exam. 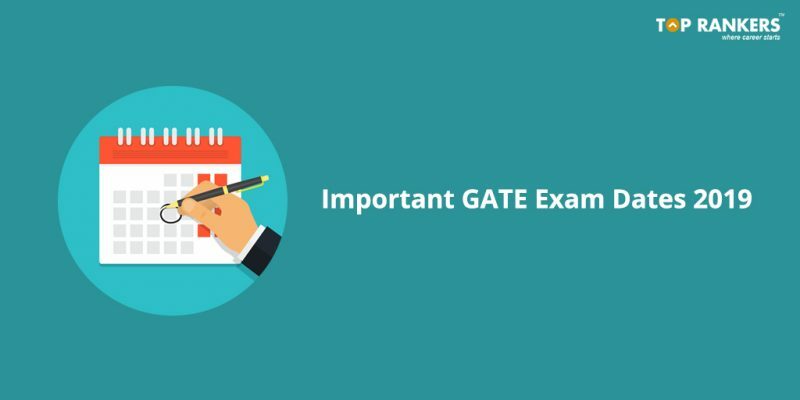 GATE exam dates 2019 – Indian Institute of Technology (IIT) Madras will conduct GATE 2019 in online mode on February 2, 3, 9 and 10 for 24 papers. Check all the important GATE exam dates 2019. The full Notification of GATE 2019 has been released today i.e 6th August, 2018. GATE Examination is organized by the IITs & IISc, Bangalore on a rotation basis. This year, the exam is managed by the IIT, Madras. Graduate Aptitude Test in Engineering (GATE) is a national level entrance examination organized for offering admission to M.Tech/ Ph.D. and other Government Scholarships/Assistantships in the domain of engineering and technology. The important dates of GATE 2019 will help the candidates to track all the essential events and stay updated about the entrance exam. Scroll down to check all the important GATE exam dates 2019 below. Check the complete eligibility criteria before applying for the GATE Exam 2019. Scroll down to know more. For B.Sc/ B.Sc Research, the applicants should have 4 years Bachelor’s degree in Science (Post-Diploma/4 years after 10+2). The applicants appearing in final year are also eligible to apply for GATE 2019. For B.E/ B.Tech/ B.Pharma, the applicants should have completed 4 years B.Tech program in any stream or 3 years B.Tech lateral entry (after completing B.Sc/ Diploma in technology/ engineering). The applicants appearing in final year can also attempt for GATE 2019. For M.Sc/ MCA/ M.A or equivalent, the applicants should have completed Masters’ degree in statistics/ Computer Applications Science/ Mathematics or equivalent. The applicants appearing in final year can also apply for GATE 2019. For integrated M.E/ M.Tech or Dual degree (after diploma & 10+2), the applicants who are currently in the 2nd/3rd/4th year or have completed 5 years Integrated Master’s degree or Dual program in Engineering/Technology are eligible to apply. Note that, the year of qualification not later than 2020. For Integrated M.E./M.Tech (Post-B.Sc), the candidate should have done 4-year duration Post-B.Sc Integrated Master’s degree programs in Engineering/Technology. Candidates appearing in the 2nd/3rd/4th year of qualifying examination can also apply. For Integrated M.Sc/ B.S-M.S, the applicants should have completed 5 years integrated B.S/ M.S program. The applicants appearing in final year are also eligible to apply for GATE exam 2019. We have mentioned all the eminent information of GATE exam dates 2019. We are sure that you are working hard to clear the GATE 2019 Examination, and hence, we are confident that your efforts will be rewarded. Just keep going!